Stratford Homes Cedar Ridge | Excelsior Homes West, Inc. If you are looking for a modular lake home with a rustic cabin look, the Stratford Homes Cedar Ridge may be the perfect floor plan for you! The Stratford Homes Cedar Ridge is a two bedroom, one bathroom home, perfect for any Minnesota lake lot. This home has over 1000 square feet of living space with an open concept floor plan. The kitchen, dining room, and living room have large picture windows that are perfect for any Minnesota lake view. Add an on-site constructed porch with patio doors off the living space for an extra outdoor living area to enjoy the view even more. This floor plan also features two spacious bedrooms that have easy access to the main bathroom. 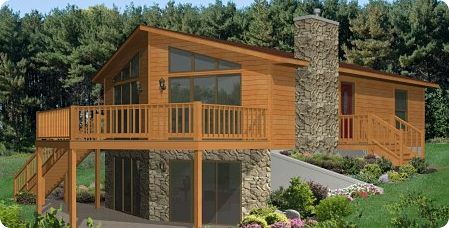 Contact Excelsior Homes West, Inc. for more information on this Stratford cabin home-Call us today! The Stratford Homes Cedar Ridge can be customized with material options and upgrades! Make this home your own by upgrading and choosing material options you like. The Stratford Homes Cedar Ridge is the perfect size for any lake cabin, but by choosing materials and finishes, you can make this cabin feel like home! Choose flooring, countertops, cabinet finishes, backsplash, exterior finishes, etc.–the options and possibilities are endless with Stratford Homes! With this floor plan, you can also add a fireplace in the living room. Imagine sitting by a cozy fire and enjoying your lake view all year round. If this home sounds perfect, call us today for pricing! We can help you build your dream Minnesota lake cabin!